I had to add some air to my car's tires the other night, and as I crouched in the dimly lit, never-been-cleaned far corner of a local service station late on a bone-chilling evening and waited for the creaky old compressor to do its thing, I realized how rarely I take pictures of the rubber that hits the road. Since their contact patches make the difference between sticking to the road and flying off of it, they may very well be the most important parts of any vehicle. But as I balanced in the shadows of my car, I wondered why I don't shoot scenes like this more often. It might seem like it isn't worthy of attention, but I come from a place where everything is worthy, and creativity revolves around making ordinary things seem extraordinary. Hence this week's theme, tires. 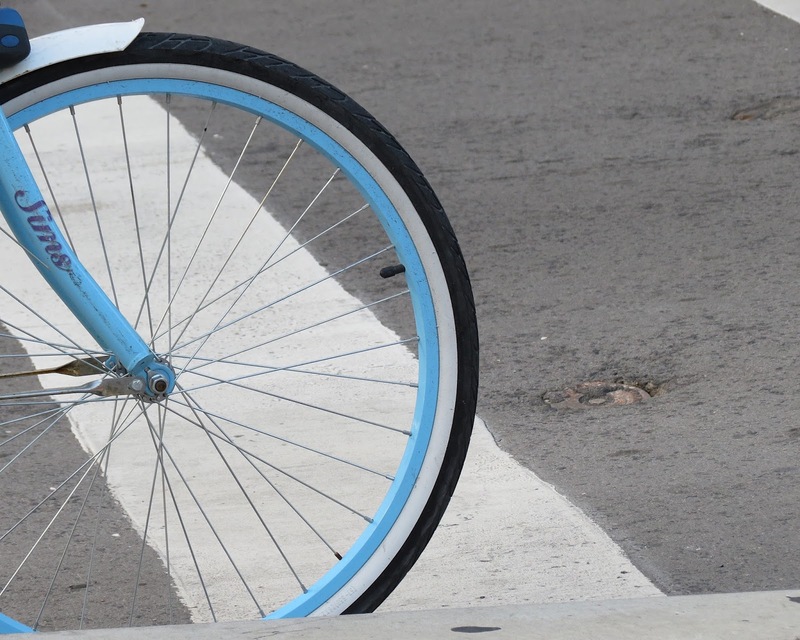 Your turn: Take a picture of a tire or tires, then share it on your blog or website. Leave a comment here letting everyone know where to find it. Visit other participants and feel free to share more snippets through the week. For more info on how Thematic works, click here. If you tweet, feel free to use the #ThematicPhotographic hashtag. And have fun with it, because photography should be fun, and that's what Thematic is all about, too. Took this in Kolkata a month back. It's years since I rode a bike and never one with such colourful tyres. Carmi, saw these tires on Main Street during the summer. The white sidewall tyres look great on this bike with the blue rims.